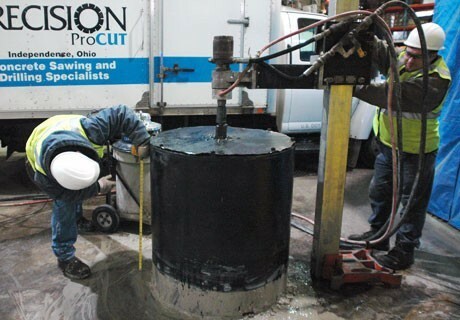 Core drilling is the method of sawing that is most commonly used when a circular hole is needed for passage through a concrete structure, slab, wall or other surface. The core drill is portable and can be hand-held or mounted to the surface to be drilled. Utilizing a wet or dry core drill bit that consists of a steel tube with diamond segments brazed or laser welded on the drilling end, it is capable of drilling through most any material encountered. Core drills can be operated in any orientation, vertical, horizontal or inverted. Electric and hydraulic powered options are available to meet specific needs and qualifications per jobsite. Holes can be drilled almost any size ranging from 3/8" to in excess of 60" in diameter and virtually any depth with tube and shaft extensions available. Round Holes of almost any diameter are commonly drilled to make openings for plumbing, electrical and HVAC installations. Core drilling is also commonly used for removal or alterations, and to create square or irregular shaped openings where convention sawing method are not effective due to space requirements, thickness of structure, or location access.